In the 2017-2018 season, an estimated 80,000 Americans died of influenza-related complications according to the Centers for Disease Control and Prevention (CDC). This had been the highest death toll in the last 40 years during the high severity season. Flu shots are the most effective prevention method for flu-related deaths yet widespread literature suggests that disparities among flu vaccine coverage exist at both a national and local level. In Health GIS: 346 during Fall of 2018, Jailyn Sronkoski utilized site suitability analysis and city owned vacant lots to determine where a future health clinic offering free flu vaccines and other services could be of most service to underserved populations. 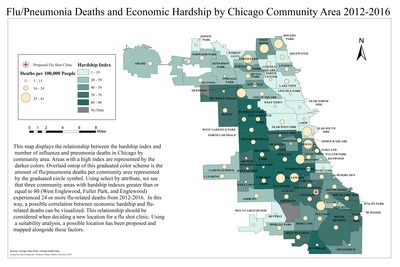 ArcGIS Business Analyst was used to identify neighborhoods of most need, weighing lack of health insurance, asthma rates, and population above age 65, all risk factors for flu / pneumonia deaths, as well as economic hardship and population density. Several potential locations were identified, and the final location was selected using Network Analysis tools to determine the most walkable location (while also considering distance from existing public transportation). This map showcases the suggested free clinic location juxtaposed against economic hardship and total flu / pneumonia deaths. Economic inequality is correlated with poor health outcomes, and certain populations such as the elderly and those with chronic illnesses are more at risk during the flu season than others. Jailyn’s maps sought to identify geographic spatial patterns of these risk factors to identify the best suitable location for a free health clinic in regard to health disparities and existing infrastructure.